Can I replicate Microsoft's Merge Formatting special paste feature in Gmail? Some Microsoft Office products (e.g. 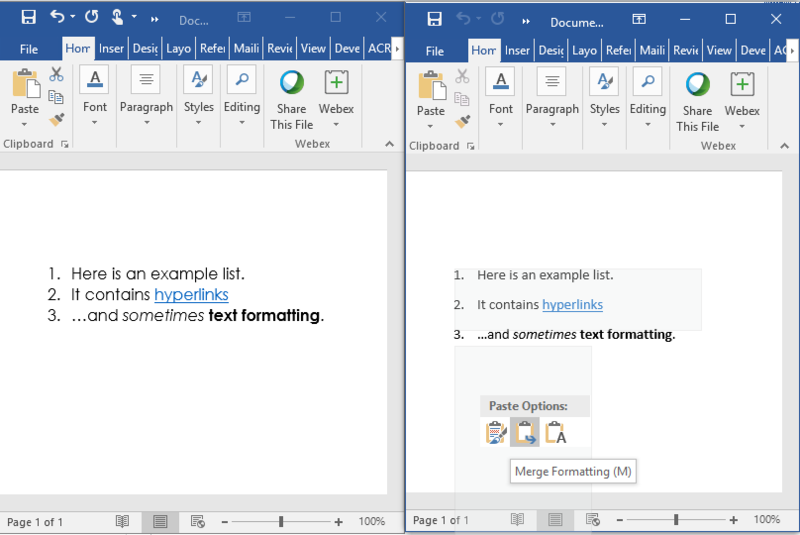 Word 2016 and Outlook 2016) have a special paste feature called Merge Formatting which retains certain formatting (like lists, hyperlinks, bold, underlined, and italicized text) but uses the destination formatting for font, line spacing, and text size. Is there any way I can achieve Merge Formatting functionality in Gmail? In other words, is there any way I can paste my clipboard contents in a Gmail email, retaining certain formatting like lists and hyperlinks, but using the destination message's font and text size? I'm willing to use browser extensions or other software if necessary. Can I merge two conversation threads in Gmail? My Gmail Account Accessed From Microsoft's IP address, Account Hacked? How can I embed a local image in gmail without using an external link?